Notes: Architects: Main Exhibition Building, Bldg. #1 - Henry Pettit & Joseph M. Wilson; Machinery Hall, Bldg. #2 - Henry Pettit & Joseph M. Wilson; Pennsylvania State Building, Bldg. #55 - H.J. Schwarzmann & Hugh Kafka; Tunisian Cafe & Bazaar, Bldg. #79 - n/a. 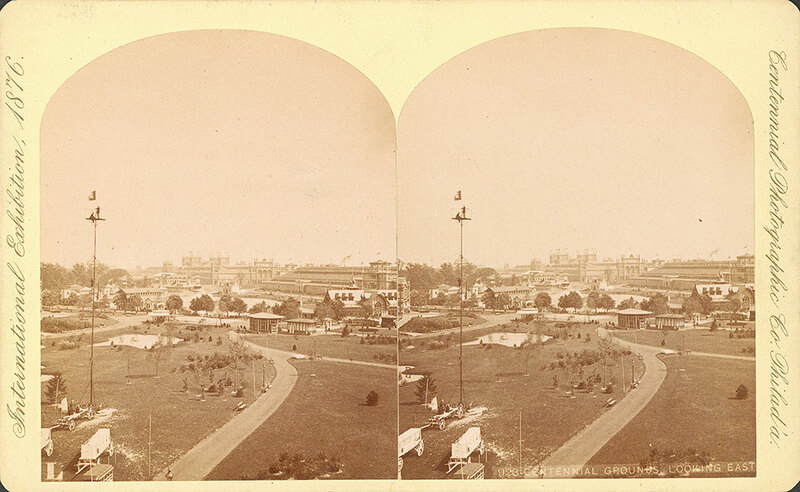 Notes: View of Centennial grounds with several buildings and the lake visible. In the foreground is a cart with a tower topped by a flag. Two men on platform at top of tower, one man climbing up the tower, and three seated on the cart.